Ankle-supporting boots are highly recommended– high-top sneakers or hiking boots are great. We sometimes run across uneven terrain, so ankle injuries are a possibility. Warm and/or wind-proof clothes, as the weather requires. This is especially important in the Spring and Fall. Gloves are a good idea in the winter. However, in the Summer a T-shirt and shorts is usually fine! Helmet. Put on a helmet, and a vest with a radio and a hook-knife. Harness. The pilot or an assistant will help you put on the harness. There are 4 buckles: (2) leg straps, a waist strap, and a chest strap. It’s a little awkward on the ground with your shoulders pinched between the metal bars. The bar will move out of the way later. IMPORTANT: Check your leg straps for the right looseness– loose enough that you can fit your flat hand through next to your leg, but no looser than that. If your leg straps are too loose, you will have trouble pushing yourself into your seat. If your leg straps are too tight, you will have trouble running, or worse: you will be involuntarily “scooped” into the seat before we are truly flying, causing us to abort the launch with the motor and pilot on top of you. 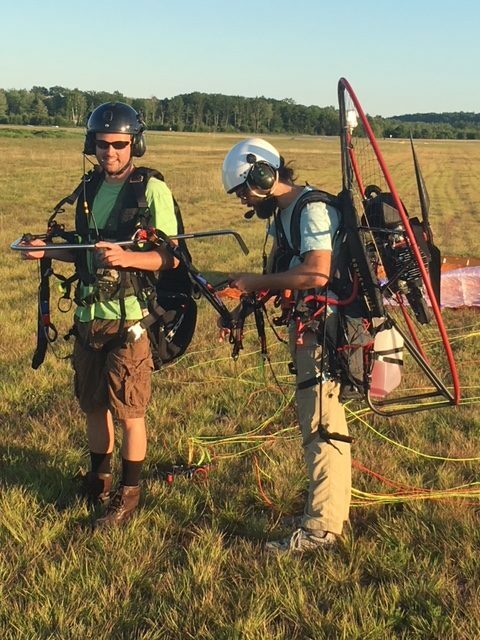 The passenger is in his harness with all buckles fastened as the pilot attaches the wing (photo by Mark Perkins). Wing. The pilot will connect you to the wing, then put on the motor and connect to you from behind. Motor. The pilot will start the motor. You may be asked to shuffle left or right to straighten things out with the wing. 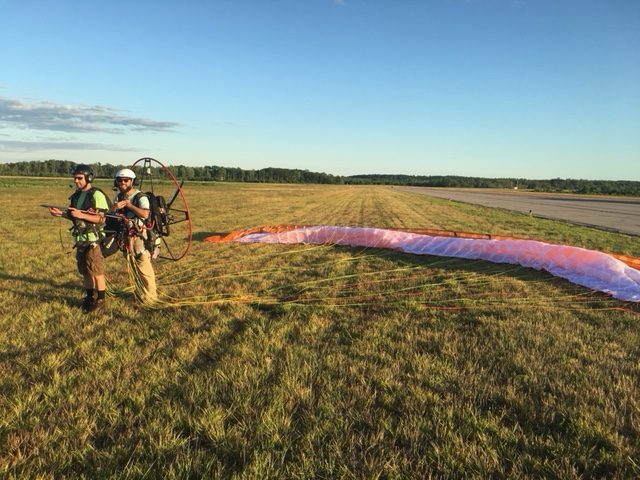 Passenger and Pilot are ready to run (photo by Mark Perkins). Keep Running. Don’t stop running, even after we leave the ground. Run into the air. Run like Wiley Coyote. Reason: Sometimes we have a small “dolphining” oscillation on launch, resulting in us coming back to the ground. You will need to run again. In para-sports, it’s a matter of safety to keep your feet down and ready to run anytime we’re below 50 feet from the ground. Get Comfortable. Above 100 feet (approximately tree-top level), you can get into your harness. Use your hands against the sides of your harness to push yourself up and back into the seat. Relax. Enjoy your hard work! If your arms reach the brakes, I’ll give you a chance to fly. 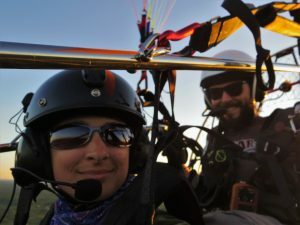 We can practice some situations that you will find yourself in during solo flight, or we can just fly around and let you get used to the feeling. Landing is running. Just before we land, at about 100 feet, I’ll tell you to lean forward and get out of your harness. That means slide forward and let your legs dangle. Then, put one foot in front of the other. This prepares your legs to run when we touch the ground. The best way I can describe this sensation is like stepping off a moving walkway onto a non-moving floor. You’ve got to run it out. There is no step 10. You just flew the lightest kind of fixed-wing aircraft! Congrats! All tandem flights offered are instructional, and are conducted under FAA Exemption #9751. No Jumping during launch– Just run steadily forward when I yell “RUN RUN RUN.” Hopping and/or letting the seat to scoop you off the ground will not result in us flying, as it causes our weight to bounce under the wing, and best-case I’ll have to reduce power until the oscillations stop.